Knowledge of the normal number of teeth is helpful but not essential for the recognition of abnormal teeth or an abnormal number of teeth. Crowding from extra teeth, multiple missing teeth or the recognition of dissymmetry can be an indication of an abnormal number of teeth. In each situation, dental radiographs are very helpful for the diagnosis of the condition. An abnormal number of teeth may be clinically significant, functionally important or unimportant. Supernumerary (extra) teeth, oligodontia (few teeth) and anodontia (no teeth) are all conditions with an abnormal number of teeth. Supernumerary teeth can cause crowding and predispose the pet to periodontal disease, create a malocclusion or result in teeth grinding. 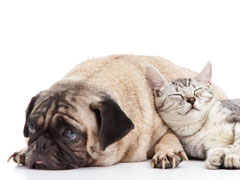 Supernumerary teeth are common in dogs especially of the incisors and premolar teeth. 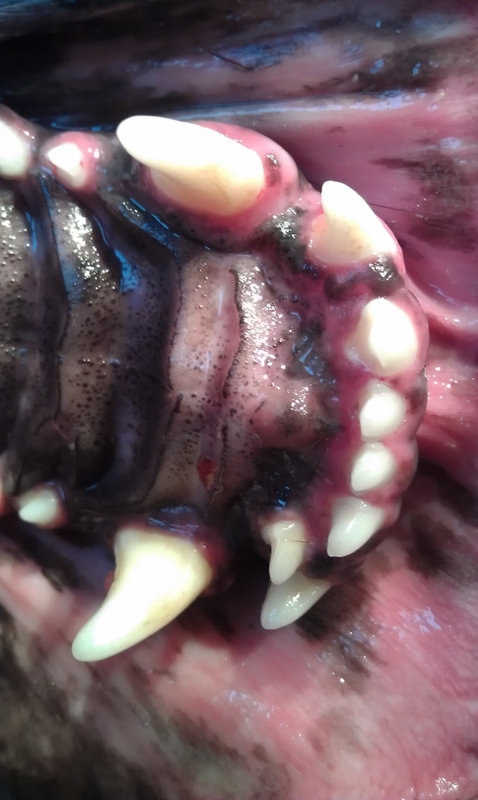 Supernumerary teeth are significantly less common in cats compared to dogs in our clinical experience, however they do occur as shown below in clinical cases. Missing teeth must be confirmed with dental radiographs to make sure the tooth is not unerupted or impacted. Unerupted or impacted teeth can lead to dentigerous or radicular cysts. These cysts are typically nonpainful but they can be very locally destructive. Cat with supernumerary (too many) premolar teeth. teeth suggests an inherited condition. to avoid discomfort and teeth grinding. dental extraction of supernumerary tooth. The owner of the above cat was excited to report that the "teeth grinding" behavior ended after the supernumerary teeth were surgically removed. She also reported that the cat seems playful, more happy and has developed a remarkable purr never heard previously. Small breeds of dogs commonly present with teeth that appear to be missing that have failed to erupt. This lower right premolar appears to be missing. malpositioned, embedded first premolar tooth. of the embedded premolar tooth. on the lower left premolar area. Dental radiograph confirms the embedded tooth. Clinical photo of embeded tooth. Check out oral cysts for more information. Dog with abnormal tooth development. This dog had multiple problems. Dog with supernumerary upper fourth premolar tooth. upper fourth premolar tooth (close up view). tooth was exposed and carefully extracted. blood vessels, nerves or the eye. Dog having persistent primary teeth. secondary (adult) teeth is evident. Supernumerary Teeth= abnormal extra tooth. Rottweiler with supernumerary upper incisor. The supernumerary incisor was removed to stop trauma to the lower teeth.